If there’s one food that I could eat every single day it would be pasta, and the higher the quality, the better. 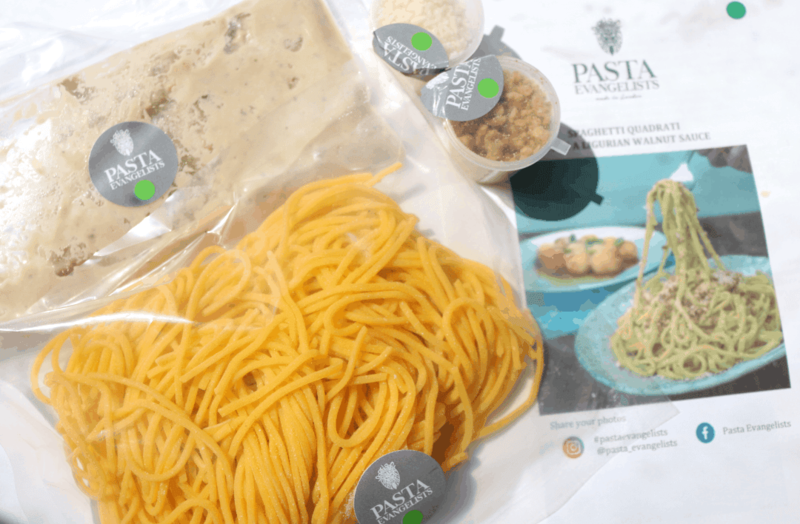 Needless to say, I was looking forward to receiving a delivery from Pasta Evangelists who specialise in creating and delivering fresh artisanal pasta dishes, which are then shipped straight to your door from their London based location. 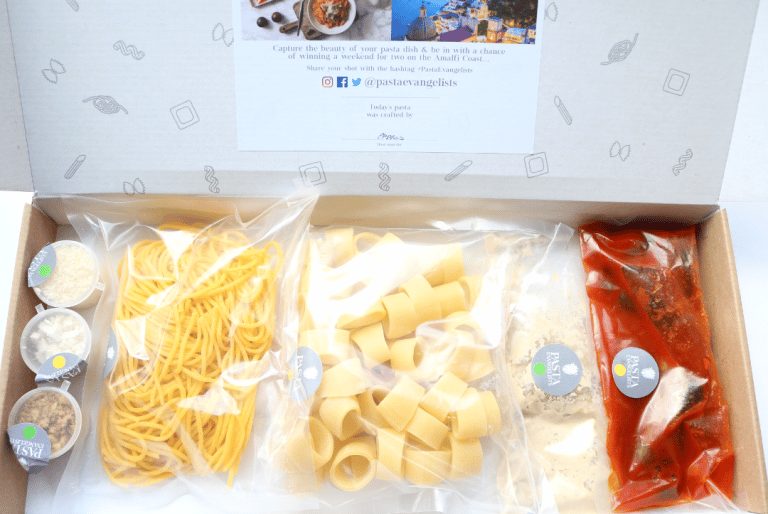 All you need to do when the box arrives is follow their easy instructions and hey presto, you’ll be enjoying the most delicious pasta that you’ve ever tasted in a matter of minutes! 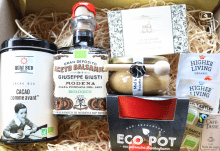 The chefs at Pasta Evangelists use only the finest seasonal ingredients and source these direct from Italy where possible to keep the recipes authentic. This means that you can try out a wide range of Italian pasta dishes, and indulge in some interesting flavours and different types of pasta that you may not have tasted before. 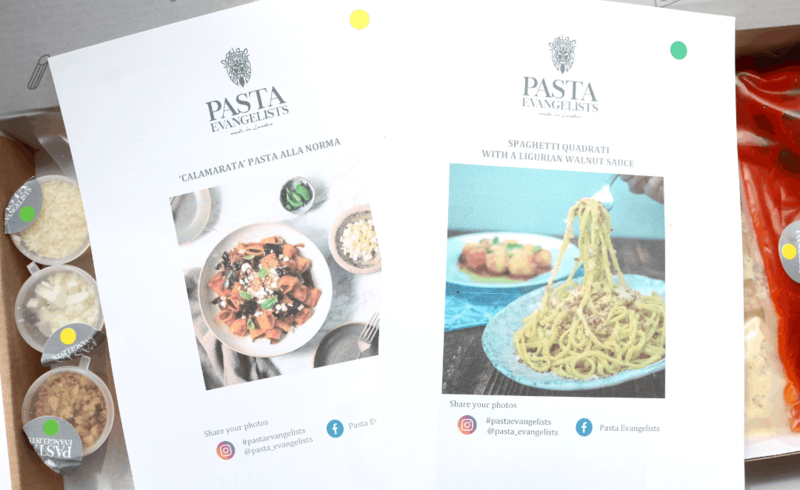 With a menu that changes every week, Pasta Evangelists cater for both meat eaters and vegetarians, so I couldn’t wait to try out two of their exquisite dishes when they arrived a couple of days ago. 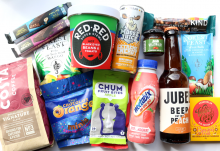 The box arrived via courier and came with plenty of chill bags and recyclable wool-lined padding to keep the fresh ingredients cold during transit. 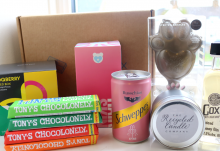 As you can see, everything is already prepared for you in individual portions and there are handy colour coordinated dots so that you know what to use for each recipe. On top of the box were two vegetarian recipe leaflets for the meals inside and these looked amazing! As well as the instructions, there’s also a brief history story about the dishes on the reverse which I found very interesting to read about. Calamarata is a type of thick ring pasta which originates from Napoli. It’s revered as a rare pasta shape and I haven’t seen anything quite this big before – these rings are seriously chunky! Traditionally, Calamarata is often dyed with black squid ink, but as this dish is suitable for vegetarians, it’s squid free, which explains the normal pasta colour. 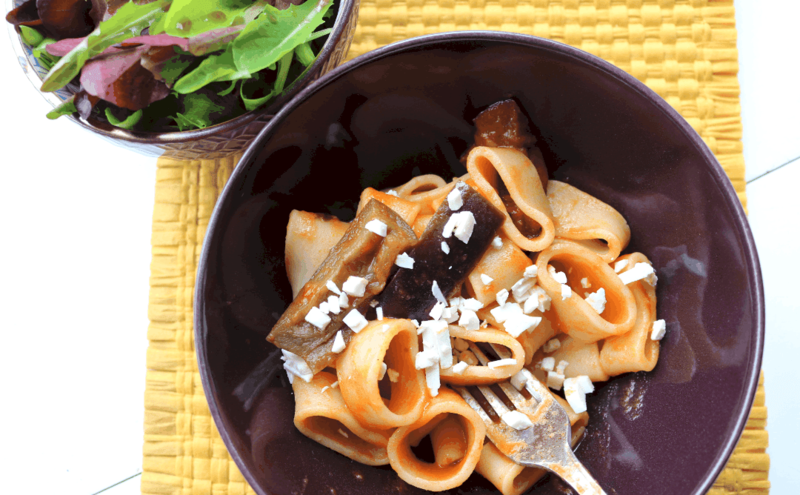 For this meal, Pasta Evangelists have mixed Calamarata with a Norma based sauce from Sicily that’s made with rich, plump, blushing San Marzano tomatoes, and fresh aubergines which are grown in the outskirts of Catania, a sun-drenched commune in the east of Sicily. To finish this off, there’s the classic Ricotta salata, a firm and salty cheese that’s a popular Italian topping to many pasta dishes. 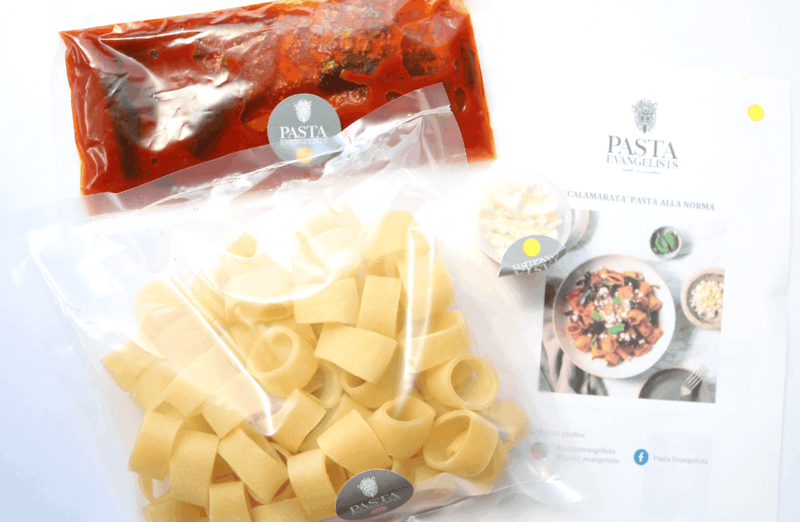 Making it was very easy – the pasta was boiled for around 5-6 minutes until al dente, and the Norma sauce simply needed heating up with a splash of water, before the cooked pasta was stirred into it. The sprinkling of Ricotta finished it off perfectly. I really enjoyed this one, and the pasta serving size was definitely generous, in fact, I split it with one of my housemates as it was far too much for me to eat on my own. The aubergine pieces were nice and ‘meaty’, and the thick ringed pasta went well with the sweet and tangy Norma sauce, plus the Ricotta gave it just the right amount of salt that was needed to balance out the sweetness of the sauce. Very tasty! Walnut Sauce is a classic dish from Genova, and it’s rarely available in other parts of Italy, let alone outside of the country itself. Some people from outside of Genova call this sauce Pesto di Noci, and this sauce is made with beautiful walnuts that are sourced from Sorrento, blended with fresh sage, garlic and a drop of milk. 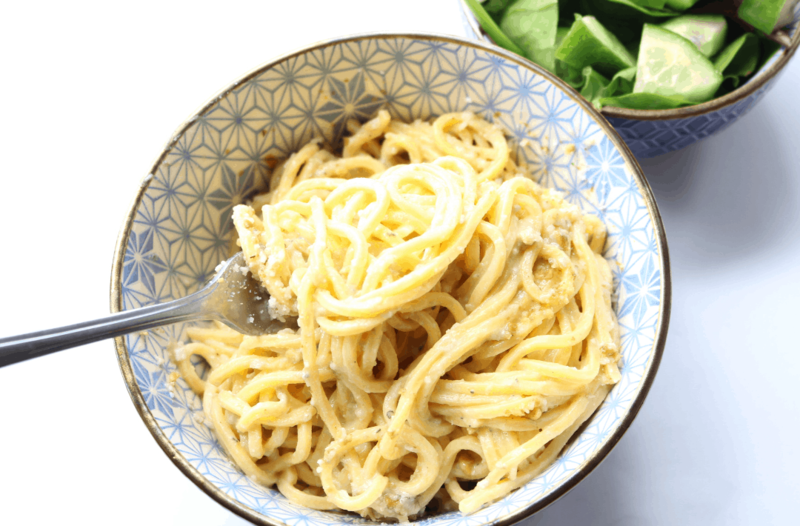 To complement this delicate sauce, Pasta Evangelists have paired it with hand-crafted fresh Spaghetti Quadrati from Lazio, the home region of Roma, the Italian capital, for a combination made in heaven. When I opened the bag of Spaghetti, I could immediately tell how beautiful and fresh it was and I couldn’t wait to make this dish! Like the first dish, this one was also incredibly easy to make and it was ready in about 5 minutes as the Spaghetti only needed 3-4 minutes to cook, before being added to the heated up sauce. My mouth was watering when I transferred it to the bowl, and it tastes as good as it looks. The texture of the Spaghetti was incredible and it’s one of the best that I’ve ever tried. The Walnut Sauce was also wonderfully delicious; creamy and indulgent, but not as heavy as I was expecting, with delicate pieces of walnuts adding their unique taste to the meal. Absolutely delicious and a very generous portion size again, although this time I didn’t want anyone to share it! Pasta Evangelists gets a well deserved 10/10 - their dishes are top restaurant quality and you'll be hard-pressed to find tastier pasta in the UK!